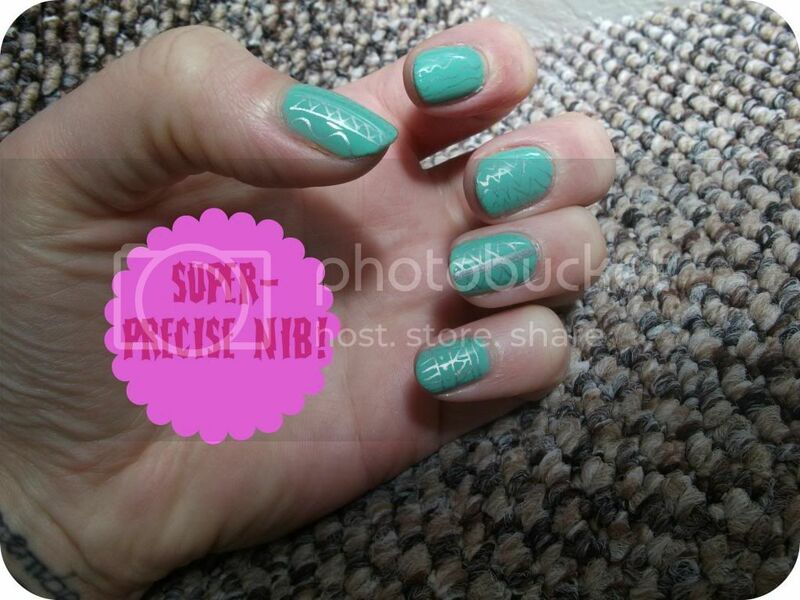 Barry M have recently released some nail art pens, which are available in four colours. Browsing in Superdrug, I inevitably ended up purchasing one, and I went for Silver since I already have Models Own nail art pens in the other three colours available - pink, black and white. In sturdy packaging which matches the colour of the product, these would be great for travelling with little risk of them getting squashed and exploding. The lid snaps off to reveal a white nib which is completely different to the Models Own nail art pens; following the instructions, I shook before removing the lid and then pumped the nib on a piece of paper until the paint began to flow. I found I got a smooth, constant stream of paint which was really easy to work with and didn't blob or bubble; that's a problem I've had with all my Models Own pens. 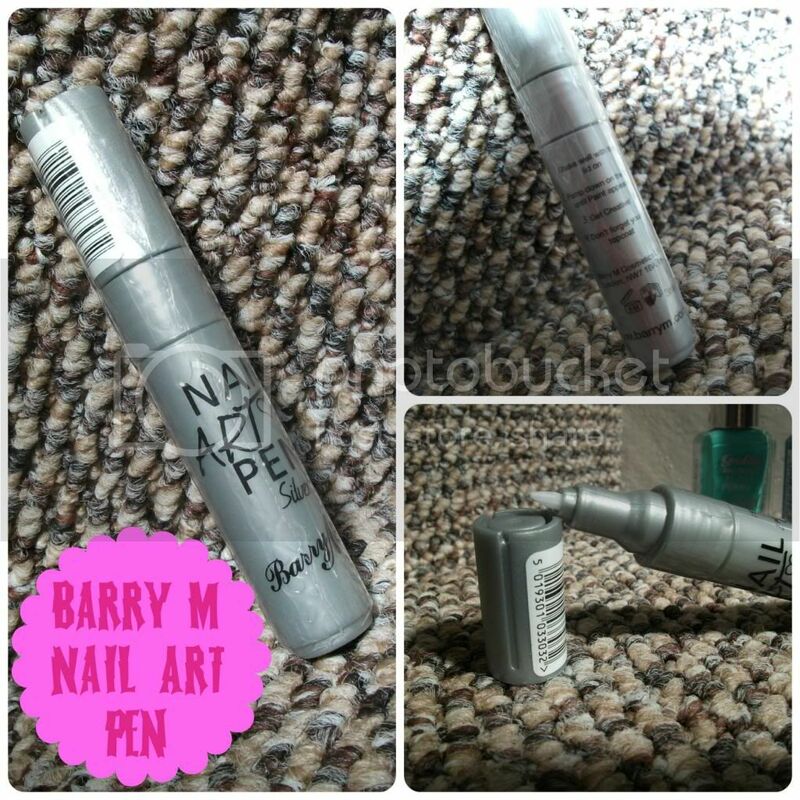 Not having to constantly squeeze the pen meant my hand was much steadier, and in general I found the Barry M pen much easier to use, a lot quicker, and it dried in no time as well, meaning it could quickly be sealed with a top coat and I was good to go. For this review, I just had a play round on the manicure I was already sporting, which is two coats of a mint polish from Gold by Giles at New Look. I prefer this pen infinitely to the Models Own ones I've used before - they're so much quicker and easier to use, with no blobbing or bubbling of the paint as you draw, and because the nib is plastic rather than metal, there's much less risk of denting or scratching your base colour. Overall, this is definitely a product I recommend and I can see myself picking up the other three colours available and doing away with my Models Own versions - these are so much better and cheaper, too! Nice one, Barry M.
These look really good, may have to get one then practice getting a steadier hand! LOVE Barry M polishes. Have 6 Gelly's and counting. Not tried the pens though but that's next to come! I really like your blog and have started following you on GFC. It would mean a lot if you could check out my blog too :) Who knows, maybe even follow if you like it? Your nails look lovely! 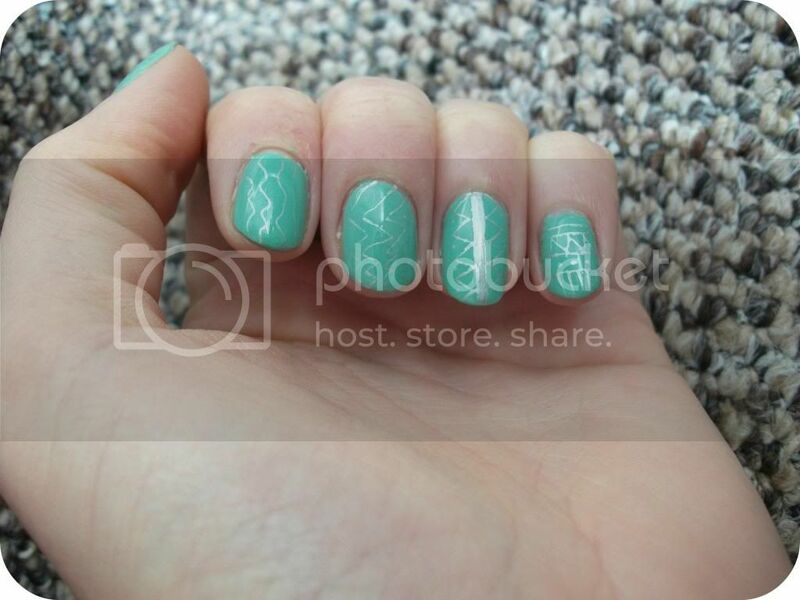 I wish I had the patience for nail art, I'm too lazy though haha! i love this, that is a very precise nib. I looks wonderful on you! Looks such a mess on me, you are so lucky! You've done a great job! Silver is a great way to have more subtle nail art.